Home » What's Battering » Lady Iron Chef Visits All The Batter! Lady Iron Chef Visits All The Batter! First Avocado Cafe in Singapore! And we are definitely honoured! Thanks a million to Lady Iron Chef for coming by to try out our Avocado Cakes, Desserts and Drinks! 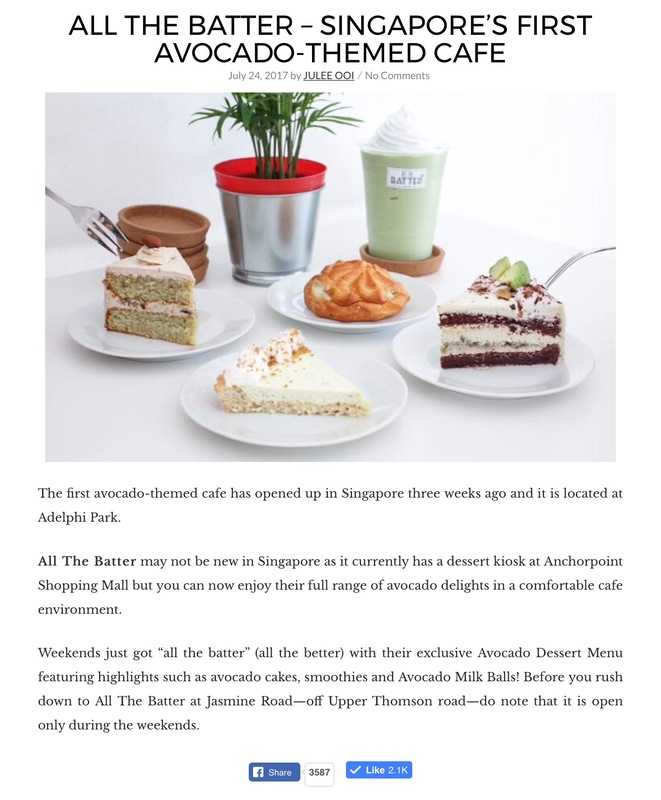 We are glad to have our signature The Avocado Rhapsody and Avocado Gula Melaka cakes featured, along with the Avocado Citrus Pie, Avocado Milk Balls, and our Avocado Drinks! Our Avocado drinks are made pure with natural ingredients to bring out the best flavour of Avocados – which is made specially for you to enjoy the fruit’s natural creaminess! We create flavours that inspired by your favourite desserts, without artificial sweeteners added to our drinks! Do come by to try our signature Avocado & Chocolate, ou the Avocado Chocolate Ganache which is an Artisan flavour available only at Adelphi Park. Do drop by our store this weekends and we are all excited to see you! ← Honestbee – We’re buzzing on it!